Our role is basically to inform the general public that AA exists and where it is. 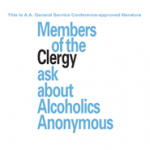 The nature of Alcoholics ANONYMOUS makes the task a delicate balancing act. However our own handbooks and traditions make the job more clear-cut than it might sound. We do not actively promote AA, nor do we affiliate with any other group or organisation or political party. So what do we do?! We try to attract people to our meetings by telling them about AA and letting them know where our meetings are. We give professionals that will come into contact with active alcoholics as much information as they want about AA. We are also always delighted to oblige should they show an interest in having some of our literature to give to clients, loved-ones or service users. We do all we can to arrange for members of Mid Surrey’s AA “fellowship” to provide talks or presentations for any group that is interested. We never charge for these events, not even travel costs. This is in keeping with our tradition which states that we do not accept outside contributions. I am always delighted if a non-alcoholic who works in the field of addiction, mental health, law and order or whatever it may be shows an interest in coming to a meeting. There is nothing quite like hearing an hour or more of personal, honest testimony from men and women who once could do nothing but drink and are now upstanding members of our community and haven’t drunk for many years. The only thing that can surpass that raw experience and help a professional such as an ambulance driver or a magistrate or GP is to hear the raw honesty of a new member who stopped drinking 48 hours previously, is still shaking and scared but desperate to stop. And they do stop. Not everybody because we are all fighting a killer disease that loves to tell us that we do not have the disease. But come to a meeting of Alcoholics Anonymous and you will see evidence greater than any booklet or T.V. documentary of how recovery is possible. Alcoholism can take anyone form any class, gender, age or race. Recovery is available to anyone of any class, gender, age or race. The events at which we have covered during my time as Public Information Liason Officer are too many to name but AA organises weekly meetings in prisons and rehabs, goes into schools, NHS events, has done talks for various mental health services and has various presentations planned for the future in the Surrey Area. Should you want a visit organised by Mid Surrey PI Team then just write to pi@aamidsurrey.org.uk and we will organise it for you. The visit can be structured around your time-table and a presentation can be as long or short as your business, surgery or team of employees would like it to be. We tend to send a minimum of one male and one female member of AA. As mentioned above the visit is on a completely voluntary basis but the members are chosen carefully to fit the occasion or institution to which they will present. Distribution of literature and lists of where to find meetings for those who feel that they are attracted to the idea of AA.